Samvida Vacancy 2018 In UP Govt Jobs Shikshak Clerk Panchayati raj MTS Safai Karmi Vibhag Bharti Latest News Samvida Vacancy in UP 2018 Information is Available. Delhi Police Constable Cut Off Marks 2017 You can search Delhi DP Merit list from Adv No F.No.3/5/2016-P&P-I. The Staff Selection commission conducted written exam in Allahabad region and total 33999 candidates have participated from Gorakhpur, Kanpur, Lucknow and Agra etc. From 5 December to 8th December in three phase’s written exam made. 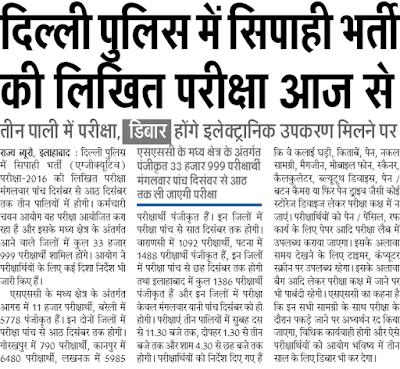 We have found this news from Hindi news papers and more details is here at delhipolicerecruitment.nic.in. Delhi Police Constable Answer Key 2017 is available on website for written exam held between 5 to 8 December2017. Total 33999 candidates are waiting for Result and answer key both. After issuing notification by SSC, SSC has also published the June calendar and constable waiters we tell you, SSC GD 2017 exam going to held on 18 to 28th June 2018. 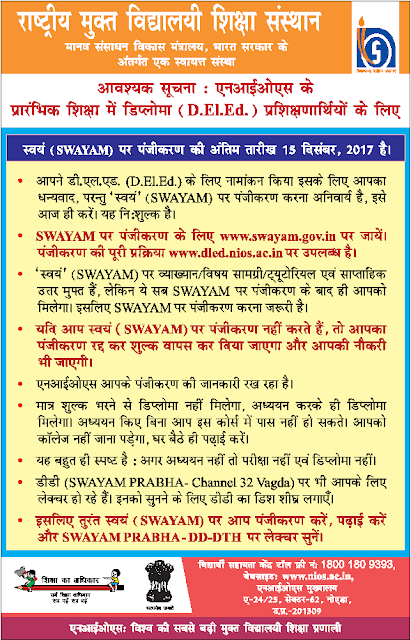 NIOS SWAYAM D.El.Ed Syllabus 2018 is available to download for those aspirants who have register themselves online website swayam.gov.in. All important things are Study Material of NIOS D.El.Ed who is for In-service or Un-trained teacher in all over the country. UP CDTP Scheme 2018 is Launched by CM Adityanath Yogi to give employment to Village Youth. CDTP is also called Community Development through Polytechnics in which Govt or Private polytechnic selection based on area or district where youth population is maximum. To get enrollment in CDTP Scheme in UP, you should read below notification. UP Swachh Bharat Mission Recruitment 2018 under Zila Panchayat raj adhikari UP Swachh Bharat Mission will going to reruit yojana sahayak, prerak, lekhakar, lower division clerk, data entry operator other vacancy will come soon. Uttar Pradesh Government is giving bid by publishing various tender online or by news paper by various agency who are intrested to recruitment thw UP zila panchayat raj adhikari vacancy. If every thing good some agnecy will comes and recruit by publishing UP Zila Panchayat Recruitment 2018. This is a sourcing jobs. candidates who will be selected will get salary with promotion.